after a few weeks on crutches, I developed painful blisters on my palms. I found a place that specializes in crutches and they design and sell custom crutchtips and other accessories that eliminated the problems from crutches. Also I want to add that I think people want to get off crutches too early. 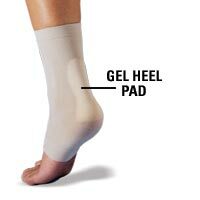 they are essential (if used properly) for returning to proper gait. If you stop to early your walk will not be normal. I used them for another month after I got the cast off (8 weeks post surgery–maybe 6) but I continued to use them as I gradually increased to full weight bearing and I have no limp or leg , hip or back pain. Way better than crutches or the other devices mentioned here is the Rolleraid. It is like a scooter that allows you to skate along with your injured leg in a kneeling position. I rented one after my surgery until I was placed in a boot 2 weeks post op, and it was lifesaver. Find a sports medicine store or medical supply store where you can rent them by the week. I found this amazingly useful and Chris is very prompt and efficient. I used my caddy for 6 weeks and have not regretted it! Hi, First Post. Total AT tear, 2/15/11. Had partial rupture same leg 30 yrs ago. Cast only. Never fully regained funtion and lost a lot of calf muscle from first rupture. However, I learned to compemsate with my chicken leg and trained karate all my life. Now instructor age 50. Also smoked until 2 days ago. Cant decide to have surgery or not. getting different opinons. Question for my fellow ATR. Did anyone have the surgery who is a smoker. We know there is a higher risk of complications with the incisision healing. I got a pair of Smart Crutches - and they helped a bit. Bit of a review here. Not great round the house but make distance a bit easier. I ruptured my Achilles 3 months ago trying to get in shape this spring. After a trip to the urgent care, I was on regular crutches for a week before for seeing a specialist at Twin Cities Orthopedic. They had these cool new crutches called Mobilegs. I ended up buying the high end model. These things are awesome. What a transformation in my mobility! Hi, when I first read this blog site I remember seeing a product that someone recommended but can’t find it now. It was some kind of over the top shoe cover that went on your good foot to bring it up to the same height as the ATR leg whilst in a boot of some kind. Can anyone remind me of the product name or provide the link please. Pringles, was that the ‘even up limb leveller’ bcurr got - post W3D1 July 24th. Thanks ali - that’s the one. even up limb leveler. I’ve been searching for all types. Just need to work out if I go for a 9 or a 10. I’m a size 9 in most shoes. I would say 9 as the sizing was pretty spot on. I wore trainers with mine and got the size above and it was slightly too big but still ok. I just got a boot after a little over four weeks. Walking around i noticed the huge height difference between my feet. Nothing like having one problem and creating another. This discrepancy starts to cause back problems. Being a do it yourselfer, I took an old thong (the rubber sandal type) and removed the upper strap part. I inserted this into my shoe as a lift. Seems to work quite well. It would be best to measure the exact height difference and insert a shim of that size. Anyone find some sort of sock to put over your cast? I’ve been searching non-stop for a sock large enough to fit over the cast. The one featured above is entirely too small and the picture is not accurate. Any tips on what you used would be helpful. I have surgery tomorrow and live in Chicago, so I need something to keep the toes warm! I googled ‘Cast Sock’ and came up with one from Medcare. I’m a long time reader, but first time poster. This site has been so inspirational in helping with my recovery. I just want to say THANKS! to all who have shared their lives. I’m 15 weeks from surgery and trying to stay as positive as possible. I opted for early weightbearing, but my doctor insisted on no “active” stretching. He is very experienced (300 procedures) and cautioned me about healing “long”. I’ve spent the summer on the bike (wonderful), stairmaster (my weapon of choice) and the track (joyful but frustrating). I’ve tried to “listen” to my body and stay as positive as possible through the ups and downs. This site has helped inspire me and instilled patience and perspective. It’s been a beacon of light in a sometimes dark tunnel. I wanted to share a couple of things that helped me significantly: When i was in the boot, there is a device called Evenup that levels out your leg length and allows for more comfortable EWB. Also, a cream called Penetrex that I found helpful to dull the ache and allow for more a “normal” gait pattern. I’m grateful for the simple pleasure of walking, jogging and riding bikes with family. When the injury happened, I was resuming training for senior tournament tennis. I was a semi finalist at the US National Championships in Mens 55’s, and I was planning on resuming the chase for the “Gold Ball” (US National Champion). It was my last “goal” in the sport. I hope to play tennis again, but that still seems “light years” away. My surgeon, who has worked on a number of athletes, says that most can resume their sport, but that very few ever get back to that last “elite” level. I was inspired by Misty May Treanor at the Olympics. It took her 18 months, but she came back and won gold. In any case, I’ve been trying to learn the “life lessons” that this injury offers. I’ve been so inspired by others on this site. I would like to help anyone that I can, so feel free to ask questions (or offer any advice to a “geezer jock” ). Humbland, start a blog! We’re all different. Many peopla have a small deficit after healing, but quite a few have none. And some deficits matter less than others, too. Your “good” AT may be the bigger problem of the two, hard to say. BTW, you seem like a young sprout to me. At 67, after 2 ATRs and a heart valve replacement, I just played my first (indoor) beach volleyball since May last night. 3-on-3 and 4-on-4 with a bunch of 30-somethings. We quit when one of the young guys said his legs were noodles. Mine were, too, and today I’m making “old man noises” when I stand up! All good, though. Keep on keepin’ on, and Good Luck. Hi all, I just wanted to vouch for the iWalkfree. I had my full rupture 2/18/13 and by week 2 I was going insane. I order the crutch and within a week I had it down and could chase my two toddlers around. It also allowed me to get back to coaching gymnastics after a month off. I thought I wouldn’t be back coaching for at least 3 months. I’m still not in the thick of it with the crutch, but I am coaching with both hands and completely not bearing weight on my foot. So it’s a win for me. Also I have been stalking this community and finally decided to join. Thank you all for your insight! I am having surgery tomorrow to repair a ruptured achilles tendon. Happened during a tennis match on Sunday. It was the scariest injury I have ever sustained. This blog has been very helpful — I felt very informed when I met with my surgeon today. I am using a knee walker — crutches were not the answer for me. The knee walker rocks. How does the knew walker work? I’m interested. I won’t be able to put weight on my right foot for awhile after tendon repair to torn tendon and haglund deformity. There’s a small step down and up out of the darn living room, where I had hoped to spend a lot of time with the tv. Maybe I could make some sort of ramp over the darn step? I would probably want to rent one, not buy. And how do i set my account up so i get email notification when someone comments to this? Thanks! Still waiting for my surgery date. The anxiety is killing me!!! I am a 22-year-old female (very young I’m told for such an injury) and four weeks post-op of my Achilles’ tendon rupture surgery. I am an avid weight-lifter and unfortunately my injury occurred while doing calf-presses (with an absurd amount of weight). I feel so much disappointment in myself for using weight I knew was not safe. Because I was so use to being very active and fit, at this point in my recovery I am really struggling emotionally with the fact that I simply have limitations. I’m curious as to how others in this situation have maintained positivity? I also have a hard time asking for help and constantly feel guilty when I do ask for help because I don’t want to burden others? Any insight into this? @rachelanne: Sorry to hear about your injury. ATR’s are no fun and the NWB phase is the absolute pits. The good thing is that NWB doesn’t last too long. Once you get into the boot and are PWB and FWB it gets a lot better. As an athlete (you, not me) you just have to accept that it happened and keep plugging along. It’s a set back but you will eventually get there. I just tried to maintain my “glass half full” mentality–some days were better than others (and some days I was ready to chuck the glass at a family member.) As for asking for help–I know it’s hard but if the tables were turned, wouldn’t you want to help? That’s kind of the way I looked at it. I feel like I still “owe” some of my friends but I will pay that back later Hang in there. @rachelanne, I’m 4 weeks post-op, though mine was a reconstruction/Haglund’s excision/FHL transfer not an ATR rupture. I used to work out three times/week, both cardio and lifting, so I can understand what you’re going through. I’m trying to make do at home — a lot of one-legged squats, for example — adding weight by holding household items, for example. It’s not ideal, obviously, but it’s better than letting your whole body atrophy. Hi - I am 3 weeks post op. I am a 52 year old female and ruptured my achilles jumping out of a burpee. I thought a less intense exercise program would kill me but I have been able to keep fairly active. My trainer has rigged to rowing machines beside each other - I erg with one leg and the injured foot goes along for the ride on the second seat. That gives me the closest thing to the usual cardio rush. I am also doing weighted sit ups, push ups, planks (one foot) and using bands to do upper body work sitting on a box. The main thing is acceptance. This is a our new normal and we are powerless over the injury - not time to recover. I alllow myself a tear or two every now and then but then back to the day by day work of recovery. Sally - you are awesome!!! I just looked at that rowing machine and said naaaa! I do the bike and really sometimes I still cry on the bike. Hi Everyone. Thanks for all the insights. Please help with my decision on a vacocast achilles pro. I’m thinking about spending the money for one, but I want to be sure it will be worthwhile. I had surgery on April 1st, was in a splint for 2 weeks and now have been in a cast for 2 weeks. I will be in the cast for another 2 weeks still. At that point I will moving to a boot (I will get the boot at 6 weeks post op). Not sure what to expect as to how long I will be in the boot, PWB, vs NWB, etc. My surgeon is not very informative. I’ve also asked him about the vacocast, and he says I don’t need it by the time I get the cast off. Doesn’t say much more though. Any thoughts? Will I be likely to be in a boot long enough after 6 weeks in a cast to make the vacocast worth it? Sorry for long post. Worth it? It depends on how long you’re going to be in a boot. On modern protocols with expected progress you would generally be in a boot after week 2 at the very least. After week 6 you would have been fwb for 2 weeks, then have 2 weeks to go before ‘2 shoes’. 6 weeks in a Vacocast ok, 2 weeks in a Vacocast “expensive”. Your surgeon is being very cautious, and may have good reason, but the stats show better progress for more ambitious rehabs. Where are you based. You’ve come here on a pretty old blog page. Good luck but push your medics harder - for your own benefit. Now that I’m on my second ATR go round, I did get a proper leg scooter. But the first time I had no idea they even existed. Being a fan of the show McGiver, I decided to make one out of a walker on wheels. Many friends seem to have walkers around, so they were more that happy to lend one to me. I took the seat off and found a piece of wood that would extend the seat and provide more leg support. The seat part was mesh, so I simply duck taped the wood to it securely. (Red Green would be proud!). Next I found old seat cushion foam, put a pillow case on it and put it on the seat. Where the cast and leg met was a bit of a pain, but eventually I figured it out. It didn’t have a basket, so I strapped a square grocery bag. (We have ones that fold up and are rigid). I added some extra support to the bottom. I removed the back strap as well. The scooter worked amazingly well.The turn ratio was good. After a while I was able to make sharper turns buy using the break. Loads of fun! The new knee scooter is much slicker, but the turning ratio isn’t as good. When I was done, I removed the duck tape, wooden support and backed. Put the back strap back on and returned the walker, good as new! If you are interested in, or considering an iWalkFree 2.0 post ATR surgery, we have a recent article on our blog in which medical professionals praise the iWalk 2.0 crutch. We also have an injury resource center packed full of info on ATR, as well as other injuries. Hi, My partner has recently had surgery on his achilles, which was mis diagnosed to begin with and he was walking on it for 6 months before just the other day having it operate on. we are both very active, we work in the health and fitness feild, powerlifting and training 5-6 days a week so you can imagine how challenging this is not just for someone who is so active but for anyone. he is 3 days post op and feeling good! He is saw but the swelling has gone down a lot and the pain is much more controlled, he has his foot elevated above his heart most of the day but then when sitting he elevates it up as well but its obviously not above his heart. He is in a cast not a boot but that will obviously change, it does get quite warm in the cast where the cut is, he is keeping his foot on the side so its not laying on the cut. He is really struggling witht he crutches, they are just standard NHS ones so i have just bought him the I walk 2.0 hands free crutch. My question was should he wait a few weeks before using it or can he use it on and off during the day now. Does anyone have any experience with them? People speak very highly of them as it gives them so much freedom. he obviously wont be doing much walking around over the next couple of weeks but on and off around the house. I would have him start using it now. I used a knee scooter since that was the thing I saw people using around town and a friend who had ATR recommended it. The one time I tried the crutches I fell. Fortunately nothing was damaged And, if he isn’t already, ice as often as possible. Put the ice pack behind the knee. I think my doc said 20 minutes on and 1 hour off for ice. He can still exercise - check out agnesatr block or just do a search on Youtube for 1 footed exercise. I was working out or playing soccer 6 days a week before my surgery. I’m not yet back to playing soccer - but I’m getting close! I have been working out since about 2 weeks after surgery.